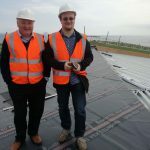 Founded by a private group of investors, including a man from the Caithness area, wherein Thurso lies, it was built in a very short period of time between August 2012 and January 2013, with the first spirit flowing on the 25th of January 2013. To pull all of this off, they hired Shane Fraser, previously production manager at Glenfarclas, to oversee the design, building and running of the place and to this date the distillery is run by Shane and colleague Iain, previously with Balmenach. 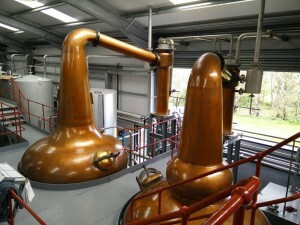 Wolfburn distillery: Neat layout – from the malt bins on the far left side…. There are no night shifts and no weekend shifts, just the two of them producing about 190.000 litres of spirit (about 120.000 LPA) in 2014 working Monday till Friday (with no distillation on Wednesdays). On site they are sometimes joined by retired policeman Charlie Ross, who now works as a tour guide whenever people like me and my brother knock on their doors. Well, actually, I advise against knocking and urge anybody interested in visiting to pre-book, as there are no visitor’s facilities at the time of our visit (June 2015) – it is a working distillery with limited visiting possibilities for the time being. So, what’s the place like? The first (and second and third…) impression was very positive. 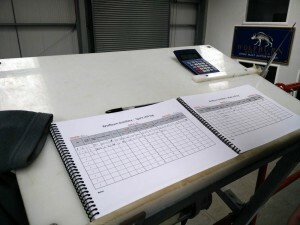 A neatly laid out production site! 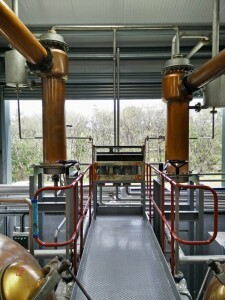 It doesn’t look like an old-fashioned, centuries old distillery with lots of small rooms and lack of space – no, it is a purpose-built, neat, clean, modern building, with almost everything on one (raised) floor. Speaking about construction: Everything, except for the mill and two big former washbacks from Caperdonich was constructed by Forsyths, with local contractors being used as much as possible. Production starts on the left hand side where the malted barley (about 30 tonnes delivered every 4-5 weeks) is stored in two malt bins and then slowly moves from left to right for milling, mashing, fermentation and distillation. 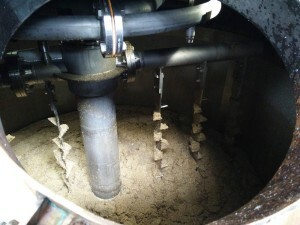 A “batch” (mash) consists of 1,1 tonnes of malt, resulting in and 5000 litres of wort (in a traditional mashing procedure with three waters) which is then fermented in one of the three steel washbacks for between 67 and 97 hours (times vary as there’s no production during the weekend). 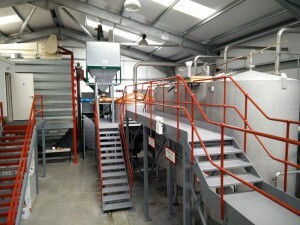 The two 56.000 litre washbacks from Caperdonich are not used for fermentation, one holds the spent lees and the other is used as a water tank. The next step is distillation: Wolfburn uses one wash- and one spirit still at 5500 and 3600 litres capacity. They’re also shaped differently: Both feature narrow necks and lyne arms which are bent downwards, but only the spirit still has a bowl in the neck which enhances copper contact and presumably also reflux (I did not ask…) resulting in a cleaner spirit which matures more quickly. The spirit cut is taken between 74 and 61 % with only 10 minutes of foreshots prior to that. 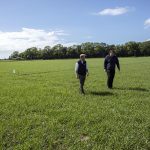 After having taken an in-depth look at the production site Charlie took us next door to the first of the two warehouses, with a third one – which will include a bottling line – in the planning stage. 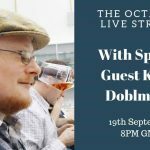 The most important question is, of course: How is the distillate? 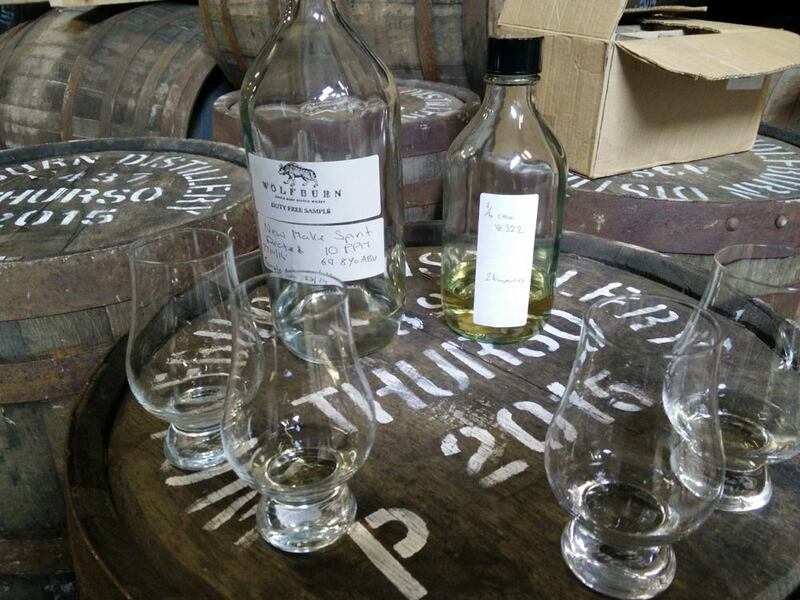 We got to taste two samples, one was a peated (10ppm) new make spirit and the other was matured in a quarter cask (#322) for 24 months. No proper tasting notes (since I was driving and only had a wee sip each) but the new make was really clean, sweet, malty with fragrant peat and no off notes, certainly one of the better new makes I’ve got to try so far. 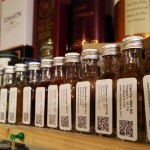 The sample from the quarter cask already showed advanced signs of subtractive maturation, taking the edge off the new make, smoothening it out and early signs of additive maturation from the wood with some additional sweetness and vanilla notes being added. Well, it has another year to go until the inaugural release and it will be interesting to see how the additional year will influence the spirit. Early signs are really good, though. Let’s stay with the warehouses for a bit: The two existing ones (and the third one will be as well) are traditional, earth-floor dunnage warehouses with casks racked just three high. 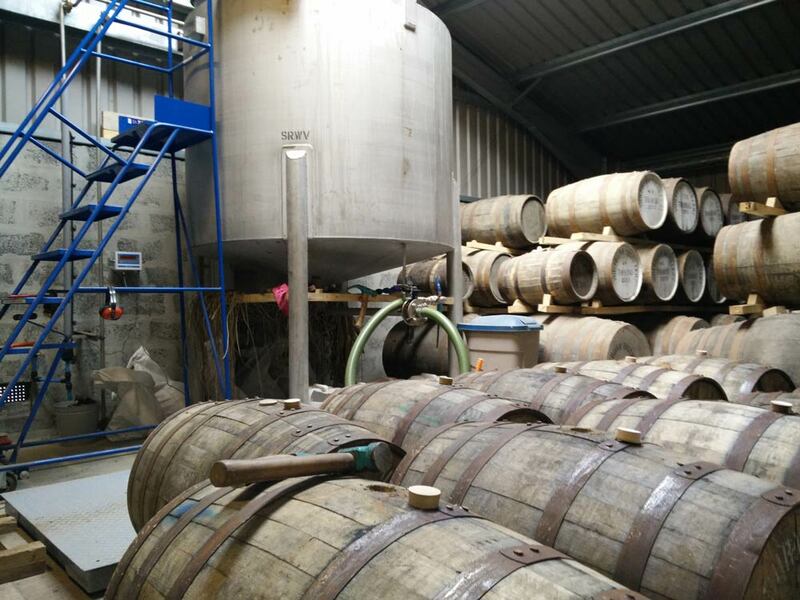 These days they mostly fill 1st fill quarter casks, which mature whisky more quickly than barrels or hogsheads due to the increased wood contact of the spirit. There are also some 2nd-fill ex-Islay casks and some ex-Sherry butts directly from Spain. So, how does the business side of things look? Well, they’re apparently really lucky to have committed investors on board. 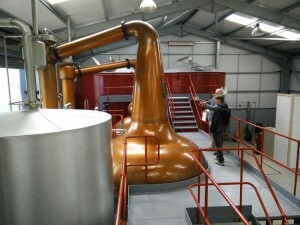 Wolfburn’s financial plan was designed for four years without any income, which has allowed them to concentrate on producing whisky for themselves rather than selling spirit, (too many) casks or merchandise. 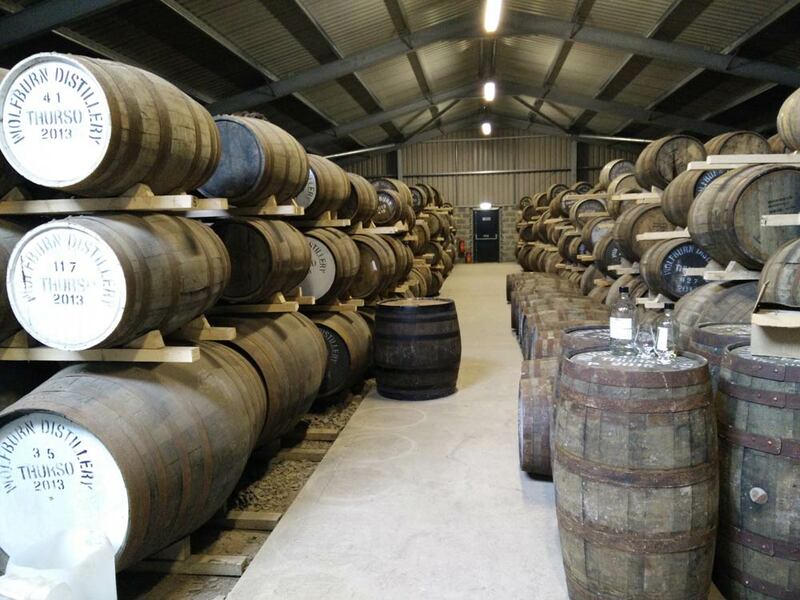 From the first year of production, which was about 900 casks, only about 30 or 40 were sold, the rest has been kept to mature for their own product. 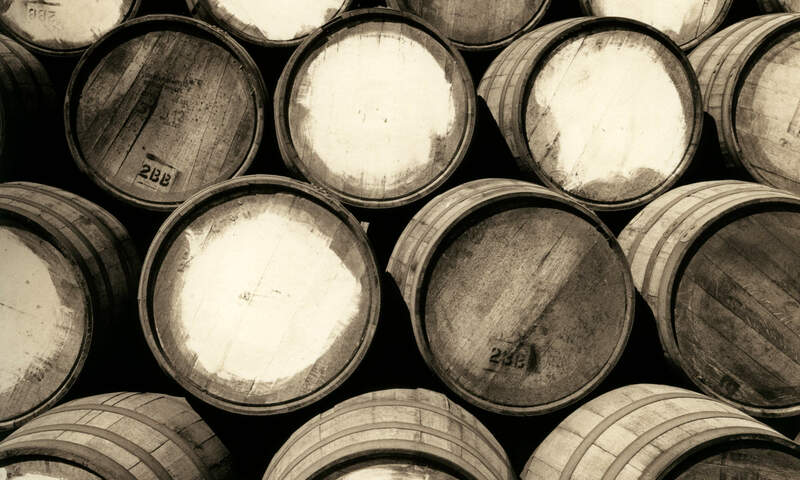 Speaking of which, the first whisky will be bottled in 2016 – 60.000 bottles in the first year and 45.000 of which are already allocated to distributors worldwide. That amounts to about 20% of their annual production capacity being bottled at a relatively young age, the goal is to keep as much stock as possible for older bottlings at 10+ years of age. Time will tell. In the end we also got to talk to Shane for a while, but it was just a brief introduction as we had to press on to our next appointment. 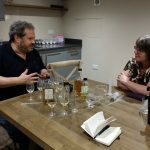 It was one of the most interesting distillery tours I’ve been on – refreshingly devoid of branding and marketing flannel but full of passion and pride. All the best to the guys at Wolfburn and thanks for the hospitality and the tour to Charlie as well as Daniel, who got us the appointment! Compliance notice: Wolfburn waived the entrance / tour fee – full editorial control remained with the author at all times. 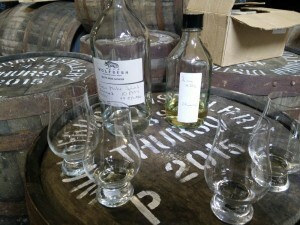 Sadly Wolfburn is not the most northerly distillery on the mainland. 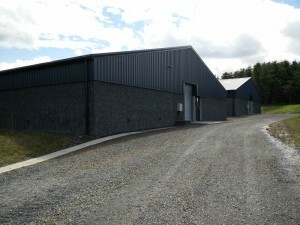 Dunnett Bay Distillery is. 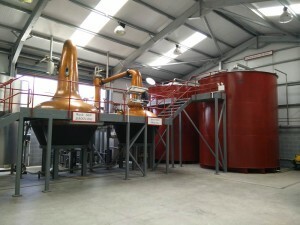 They produce gin rather than whisky. Cheers, never heard of them since I don’t really follow the gin movement, will check them out, though!